Omg when I received it was packaged all neat and nice. And when I received it was a little difficult to open but I finally got it open. When I first used it , i was amazed with how it made my whole warmer and it stayed at right temperature too. It is truly an amazing product to have and use in the home. I will continue to use it. PreviousPrevious post:Would the radiant heating film work in an RV/motorhome?NextNext post:Electric Radiant Heat Efficient? 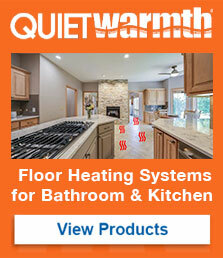 Can QuietWarmth radiant heat be used in bathrooms?